It is night. Darkness has fallen over the September night as the half moon rises and the stars begin to fill the sky over Penobscot Bay. Sometimes the night falls so deeply here in this Maine hamlet that it seems like the Sun might never rise again. It is a darkness full of potential. The year is 1898 and you are walking along a dark path in the small coastal town of Bucksport, Maine. You are alone, quite alone. You are sure of it. In the distance, you can see the vague outline of ships in the harbor and lights in the windows of the townspeople in houses you know well, for you are worker, a cleaner, a hired servant willing to scrub and polish and shine the possessions of others to make your living. For some, this might be a happy lot, but not for you. These people for whom you work could be your friends and compatriots, but that is not the case. You are, and forever will be, from away. These people are not your people and you are not one of them, but as you walk carefully along the lane, you remember your home in Nova Scotia. Sometimes you wonder what it would have been like had you never met the man you wed. You moved from your home to his, this place, and had his children and toiled away the years. Then you divorced, and though you tried to go back to Canada, you found you didn’t belong there anymore. Where is home, you wonder as you walk the dark path on the cool September night. But those thoughts are fleeting, at best. No time for regret, you tell yourself, when there is work to do. This is your home, now. As you move forward down the lane, you put your hand on your purse and recall the payments you have collected. You had nothing when you came here, but with hard work and tenacity, you needled your way into the homes and lives of the people, at first with an offer to work and then, as the years rolled past and you accumulated some small wealth, even the offer of a loan, of course, with interest to a few select individuals whose names you will never mention. It has been grind and scrape, working all hours, but you are independent. After all, though your children have grown, you still have yourself to support and you know that you will never be included, that you will always be regarded as ‘from away’ no matter how long you live among them. You may live there and walk among them, but they never truly take you in, do they? Still, there is recompense. Then you remember that you have one more stop before you head home. The stovemaker, the tin-knocker, William Treworgy owes you his payment. One last stop before bed. You reach into your purse and remove the cigarillo you just purchased less than fifteen minutes ago, the final purchase at the little store on the edge of town before they closed for the night and blew out their lanterns. They’ve seen you before at this late hour, making your rounds at the only time you can, because when tomorrow comes, you will be back to work again, cleaning their houses, tending to the smallest of their needs. The wind begins to blow as you light the match and inhale. It is a small pleasure, you think, to walk alone, independent and in charge of your life, with a purse full of small change and a life in front of you full of work. Your name is Sarah Ware and soon, very soon, something quite terrible will happen. In 1898 Maine had less than a million inhabitants and the only cities were small in comparison with neighboring states. Even today, it is a place of long distances, of varied customs and terrain. Before the turn of the century, the coastal towns and villages featured harbors full of ships that sailed to every corner of the globe and captains and crews who had been as part of the bedrock of their communities for time out of mind. I 1898, Everyone knows everyone else and everyone seems to know everyone else’s business, too. Even the smallest newsworthy morsel of information could become the topic of hot conversation, is passed by word of mouth from one householder to another with great alacrity. It doesn’t take long for the disappearance of Sarah Ware to become the subject on everyone’s lips. No one has seen her since the storeholders sold her that cigarillo before closing. Then, as now, people disappeared, moved on, took to the road without telling anyone of their passing. It isn’t unusual, except that people know her so well, she is a part of their lives and has been for years. Surely someone must know something about where she went? For now, 59 year old Sarah Ware is one of the missing. For two weeks, search parties scour the countryside. The nights are growing colder as the trees begin to change to the colors of autumn. After nearly two weeks of searching, no one has yet found hide nor hair of Sarah Ware. The good people who used her as their housekeeper make other arrangements. But what had been a local, albeit strange, disappearance, would soon make the front page of papers from Portland to Boston. It was the odor of death that eventually brings the searchers to her body. Not a mile from her own home, just off Miles Lane near the current high school parking lot, a path she trod daily for years, she is found. A raincoat is tucked up like a pillow underneath her nearly severed head. Indeed, searchers aren’t completely sure it is her at all due to the fact that her face is gone – eaten away by some wild animals. 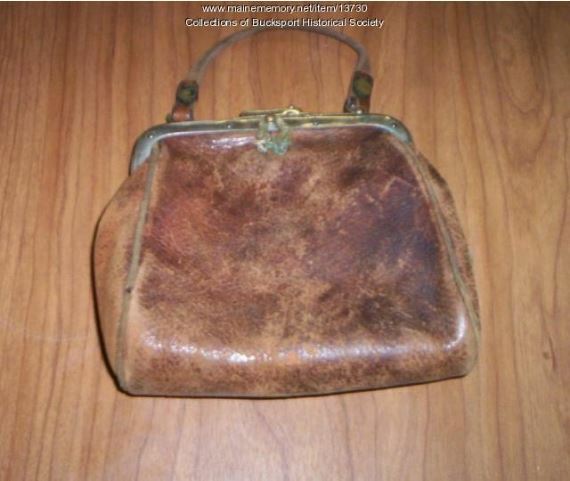 Her purse is found nearby, as well as a knife with a ragged, serrated edge, obviously used upon her. The grisly state of the corpse tells the story of a violent crime, a murder so repugnant and vile that no one could recall anything happening in Bucksport to match the extreme nature of such a ferocious crime. Her body is carefully placed in a wagon to be transported back to town, but the brutal nature of the crime was such that during the bumpy ride back into her town, her head detached from her body. When her skull is examined, now completely detached from her body, a round hole in her forehead reveals the probable cause of death. A blow with a blunt object so strong that it penetrated her cranium. One thing is clear to investigators – someone among them had committed a horrid act of bloody murder, ripe pickings for the tabloids and sensationalist newspapers of the time. Precisely who had done such a thing became front page news and the source of talk in the town for the days and weeks to come. All of New England read the papers each morning for further developments in the case. Detectives were few and far between in the State of Maine at the turn of the century. The local constabulary was poorly equipped to solve such a case so they sent for help. First, a seasoned detective from the city of Lewiston, one hundred miles away, began his investigation, soon joined by another detective from the nearby river city of Bangor. These two men, also from away, were the ones with the power to uncover the identity of the murderer and solve this most heinous of crimes. She had taken residence with an older woman, Mrs. Miles, and was her caretaker. Mrs. Miles informed the investigators that Sarah kept her earnings in a trunk in her bedroom but when it was searched, there was not a penny to be found. When deposits were checked at the local bank, the missing money was not accounted for. So perhaps money was the motive for her murder? Sarah Ware was known for her hard work and enterprise. Being alone in the world except for her children, she had to work a hardscrabble existence just to make ends meet, and at times, she might have to wait for payment from the men she worked for, or worse, not collect payment for services rendered at all. But she was a worker and people knew it. The money she had been collecting was nowhere to be found and perhaps this was the motive for the murder. 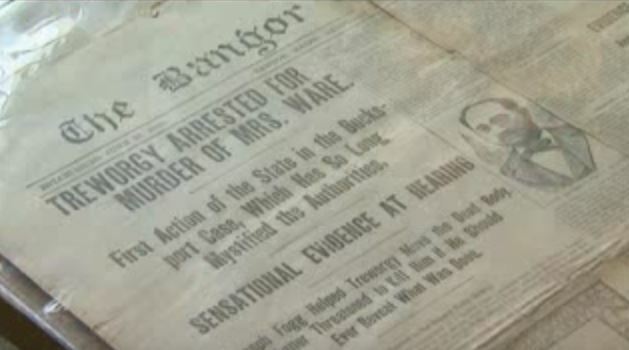 Word spread concerning the progress in the case, leading newspaper readers to speculate that someone in town owed Sarah Ware money – all they needed to do was find out who. Strangely enough, after another thorough search of the area and her house, the money that had been missing somehow had mysteriously found its way back in her trunk in her room at the Miles house. 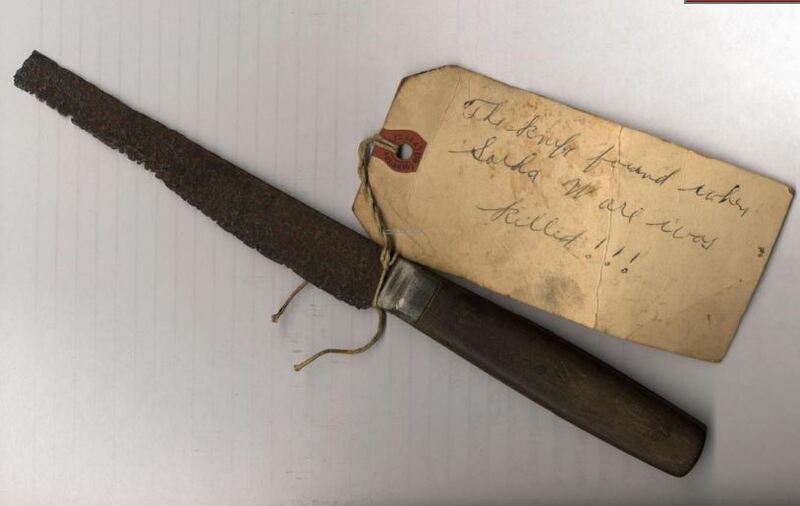 Soon enough, a bloody tarp was found in William Treworgy’s wagon – and within it was a hammer with the initials W.T.T. engraved upon it. The round ‘peg’ of the hammer seemed to match the round hole in Sarah’s skull. Treworgy denied any knowledge of the crime. He was a divorced father whose wife had left him with two daughters to raise on his own. He known for having a quick temper and word spread about that he had not paid what he owed for quite some time. His house would have been the final stop on her usual route before heading home on that fateful night. And he knew Sarah well. In fact, she had worked for him as a live-in nanny. It was understood in the town that Treworgy was a hard man to work for and that when she left, Treworgy refused to pay her what she was owed. It is entirely plausible that before going back to Mrs. Mile’s house that night, Sarah made the fateful decision to stop one more time at her old employer’s house and seek recompense from him, one more time. In those days, when a town needed the services of an outside detective from another city, they had to pay the expenses.On November 28, just as William Treworgy was implicated in the murder and the investigation began to pick up steam, the funds paying the two detectives mysteriously dried up and the case was abandoned. Apparently not everyone in the community was happy with this state of affairs and a group of concerned citizens raised five hundred dollars to pay the detectives to continue their work. The case reopened. It wasn’t until the following spring that a man named Joe Fogg, Jr. confessed to accepting payment from William Treworgy in return for disposing the body in the pasture just off Miles Lane. Such a witness was enough to bring the case to trial. But this is where the story of the murder of Sarah Ware becomes most confusing. 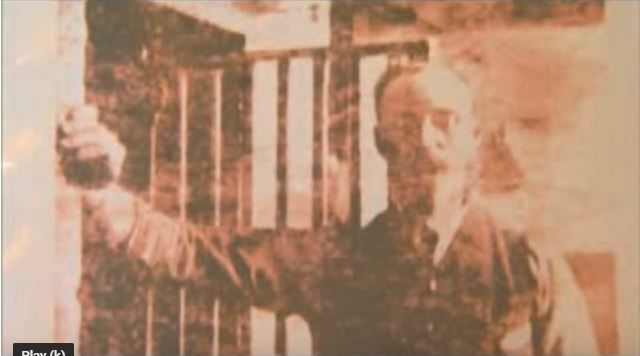 There was a murder weapon, there was motive – Ware cleaned for Treworgy and he may have borrowed money – and there was a living witness who claimed to have disposed of the body, itself a crime, willing to testify. In today’s world, this would seem to be more than enough to set the wheels of justice in motion. But not, apparently, in the world of small towns and villages that comprised rural Maine at the turn of the century. The local courts refused to hear the case, possibly because everyone knew everyone else and a fair trial seemed unlikely, as officials applied to higher courts. Three years into the review process, it landed in the purview of the Hancock County Supreme Court in the City of Ellsworth. The trial went forward with William Treworgy accused of murdering his housekeeper. By July, 1902, things started to happen, strange, unlikely things that seemed to be more than mere coincidences. Many of the people involved in the original investigation four years past, had died including the coroner who examined her corpse and determined cause of death, and deputies who took part in the search for her body and the discovery of the tarp and hammer. Then, Joseph Fogg, the witness who claimed to have helped Treworgy dispose of Sarah’s corpse, recanted his testimony, claiming that he had been forced to lie about his role in the case by the selectmen of the town of Bucksport and others. With no witnesses, all that remained was the tarp and hammer…except that these had disappeared, as well. The only piece of evidence besides the bloody knife that was found next to her body was her skull itself, kept inside a sealed box in the Ellsworth Court as evidence. It sat there in a locked case for one hundred years. Her headless body was buried in a pauper’s grave. Thirty years afterwards, the entire graveyard was dug up and moved to make way for a new man-made lake, known today as Silver Lake. Since her grave had no marker, it is not known if, in fact, her body was moved or if it lies beneath the waters, far from any marker. Oak Hill Cemetery in Bucksport does have a marker for Sarah in the Ware family plot – but all that lies there is her head. It rests in the family plot of her in-laws and near the husband she divorced. To the extent that this is still an unsolved murder in the State of Maine, this case remains active. But it is unlikely that Sarah Ware’s murder will ever be solved in any official way. What we know about William Treworgy, the loss of the evidence, the bad blood between them, it seems likely that Treworgy got away with murder. Some people claim that Sarah Ware can be seen wandering the shores of Silver Lake in the mists of a moonlit night, especially if it is a mid-September night. If ever a spirit was restless waiting for closure and justice, it would be hers. If you happen to drive down that lonely road and see her, stop for a moment and let her be. She is only seeking something we all thirst for – justice, which may only be found on the other side of the veil.